It took 26 seconds for Clemson’s exceptional freshmen to make their mark on Death Valley in leading the Tigers to a 43-19 win over the Troy Trojans Saturday afternoon. The Clemson offense overcame a slow start thanks to big plays by big time freshmen. Sammy Watkins, Mike Bellamy, and DJ Howard all scored touchdowns in their Clemson debut. It didn’t take long for Clemson fans to see the speed of the newest Tigers as Mike Bellamy took the opening kickoff 39 yards. Two plays later, Sammy Watkins caught a 33-yard touchdown pass and the Tigers took the lead 7-0. Troy committed two turnovers that led to 41 and 46-yard field goals by Chandler Catanzaro; however, the first series was definitely the highlight of the first half. The Trojans led 16-13 at half time and had nearly 200 yards of offense. The Tigers were struggling on offense as they were 0-for-8 on third downs and had only 42 yards of total offense after the initial touchdown. The third quarter started out much like the first half ended with Clemson going three-and-out, but that would change on the next Tiger possession. Quarterback Tajh Boyd rolled out of the pocked and found tight end Dwayne Allen running down the sideline. Allen scored a 54-yard touchdown that put the Tigers up 20-16. The Clemson defense forced the Trojans to punt and Boyd’s new found rhythm carried over into the next drive. The Tigers went 80 yards on 13 plays that ended with a 5-yard touchdown pass to Jaron Brown, and the Tigers led 26-16. Troy’s next drive ended with a field goal that would cut the lead to 26-19. Clemson fans would get another glimpse of the outstanding freshmen. Running back Mike Bellamy took the first carry of his Clemson career 75 yards for a touchdown. He took the handoff from Boyd, tried to go up the middle, but instead he hit the edge, and streaked down the sideline untouched. Clemson led 33-19. The Tigers would add two more scores- a Catanzaro field goal and a touchdown by DJ Howard- in the final minutes of the game. The Clemson offense and defense got off to a sluggish start against the Trojans and really didn’t find their way until the second drive of the third quarter. Tajh Boyd threw a 54-yard pass to Dwayne Allen who took it in for a touchdown giving Clemson a lead that they would never relinquish. Boyd started to settle down and gain his confidence as he went 9-for-9 for 70 yards. Offense: The day belonged to Tajh Boyd. 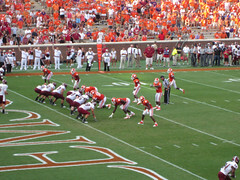 Boyd was making his first start as the Clemson quarterback. He got off to a rocky start, but he finished the day strong going 20-for-30 for 264 yards and one interception. Defense: The linebacker corps has been considered a weakness over the last few years, but as a group they stepped up their game on Saturday. Tig Willard led the defense with a career-high eight tackles. True freshman, Stephone Anthony recorded three tackles including the first sack of his career. Special Teams: Chandler Catanzaro’s success on the practice field translated into points on the score board. Catman showed no signs of his accuracy struggles from last year. Right out of the gate, he nailed a 46- yarder. He added two more long field goals later in the game of 41 and 45 yards. 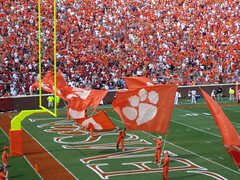 Post by ClemsonGirl.com sports blogger, Nikki Steele.